At The Crossroads Program, we believe that reaching kids before they use drugs is as important as treating those who have already succumbed to addiction. Therefore, we provide speaking engagements for middle schools, high schools, colleges, and churches. In addition, substance abuse counselors can coach and/or provide additional training for school administrators and counselors, police officers, drug-free coalitions, or any other group focused on educating young adults about drug use. If you are interested in learning more or would like to schedule a presentation to have a drug counselor provide education for adults or teens on the dangers of drug and alcohol use, contact one of our Missouri drug rehab centers today. With locations in Kansas City, St. Louis, and Columbia, we can schedule substance abuse speaking engagements throughout Missouri. When it comes to speaking engagements, our drug abuse counselors deliver talks that are different from the stereotypical drug prevention course. While our talks remain educational, we do not rely on old tactics that have proven ineffective. Scare tactics and boring lectures do not work. Lectures lack engagement, and scare tactics rarely make a difference to teens that often believe they are invincible and assume the worst can never happen to them. Therefore, our substance abuse counselors approach speaking engagements as a conversation with equals. Young adults respect honesty and want to be treated as intelligent, responsible people. Our drug talks are aimed at meeting teens on their level. Our substance abuse counselors aim to combine humor and honesty with real-world consequences in order to create a conversation to which teens can relate. These methods are important for keeping teens interested and concerned about the presentation being given. 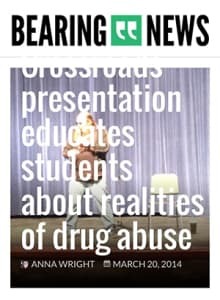 Speakers that are condescending or misleading about the real pressures and problems of drugs will not connect with their audience, leading to ineffective talks. Beyond simple drug awareness, our drug counselors teach actionable strategies for dealing with any kind of problem with drugs. That way, children and teens who may already be in trouble can start to find their way out before it is too late. We believe that these preventative talks are essential and we pride ourselves on having created a method that is engaging, informative, and sufficiently realistic in order to allow teens a chance to understand these issues on their own terms. In addition to teens, our substance abuse counselors also offer talks designed for adults. We firmly believe in the necessity of involvement by the entire family when it comes to drug prevention and recovery. This is why our treatment programs offer support groups for parents, and this is why we offer speaking engagements for adults. When parents and educators are able to identify the signs and symptoms of drug use, they can make sure a teen receives the drug treatment they need before a problem grows and worsens. Similar to our work with teens, our substance abuse counselors who speak to adults apply a finely tuned mixture of humor, facts, and consequences to make these talks as fun as they are productive. For other professionals such as teachers or police officers our speaking engagements provide a fresh approach on industry standards. Our speaking engagements are the best way to educate your community about drug issues. Whether it is through speaking to teens directly or presenting signs and symptoms to parents and teachers, our substance abuse counselors can offer important insight. Contact one of our drug rehab centers today to schedule a speaking engagement or to learn more about how our drug prevention programs can help in your community. Reach us by phone in St. Louis at 636-532-9991, in Columbia at 573-256-8020, and in Kansas City at 816-941-4000.